The Saverne Affair (or Zabern Incident) occasionally gets a mention in discussions of the origins of the First World War. It is one of those multi-dimensional disputes in which one conflict slams into another. One of those conflicts is a straight ethnic one – familiar to anyone with a passing interest in Northern Ireland – between Germans and Frenchmen. The other is between the German military and Germany’s burgeoning democracy. 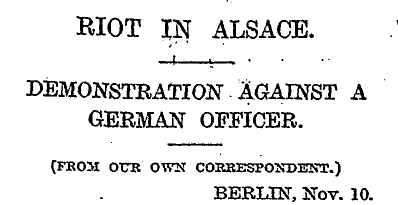 So far, a German officer has been rude (or has he?) about the Alsatians and there’s been a riot. There will be further riots followed by votes of no-confidence in the government. The point is that it served as a reminder to the French that Alsace had been lost in 1870, while in Germany, it demonstrated that democracy was advancing at the expense of the military. I believe that fear of losing their privileges was one of the factors that led Germany’s rulers to go to war. Not everything German was rejected in Alsace – for example the rigid division of land under French inheritance law was not liked, German inheritance law was a bit more flexible and was preferred. One of the principle reasons for the low French birth rate before the First World War was this rigid division of land – which meant that having more than one son was a direct threat to the unity of a farm. However, the people of Alsace (or the great majority of them) viewed themselves as FRENCH – not German. This meant that the occupation by Germany was unstable – a failed experiment. Although it should be claimed that the “French attack” of 1914 (the reason that the Imperial German government gave for declaring war on France) is mythical – no such attack happened. The German government lied, lied to have an EXCUSE FOR WAR – it is as brutal as that. And the military objective of Imperial Germany was not to gain Alsace-Lorraine (they already had Alsace-Lorraine) it was to dominate the rest of northern France. For a single power to dominate the whole coast facing this island had been unacceptable even in the days of the first Elizabeth. The German attack on Belgium and France (an attack which, I repeat, they “justified” with lies) made war between the United Kingdom and Imperial Germany unavoidable. However, none of the above should be read as my accepting as sensible the tactics with which that war was fought. It is one of the nicest areas of France. All it lacks is the sea. Paul, it none (of the many) accounts of the outbreak of the First World War have I heard of a faked French attack. Do you have a source on this? You have asked me this before Patrick. It was not a “faked attack” there was no attack at all – it was a FALSE CLIAM by the Imperial German government that France had attacked them. Is the Declaration of War a good enough source? Of course AFTER the Germans declared war the French did fight – indeed vast numbers of French soldiers died in (hopelessly disorganised) attacks in 1914. The Imperial German government claimed that the French attacked BEFORE the German attack on Belgium – this was their justification for their (the German) attack. And the German government was lying – there was no French attack. At least Adolf Hitler faked a Polish attack in 1939 (with concentration camp people being dressed in German uniforms and shot). The Imperial German government did not even do that – it just declared that a French attack had happened, without even bothering to fake any “evidence” of one. Patrick – if your read the German Declaration of War against France on August 3rd 1914 they even declare that French aircraft had bombed the railway near Nuremburg. The document (the Declaration of War by Germany against France) is a tissue of lies. “But why do not the text books not mention all this”. I did not write them, but I will speculate as to the reason. 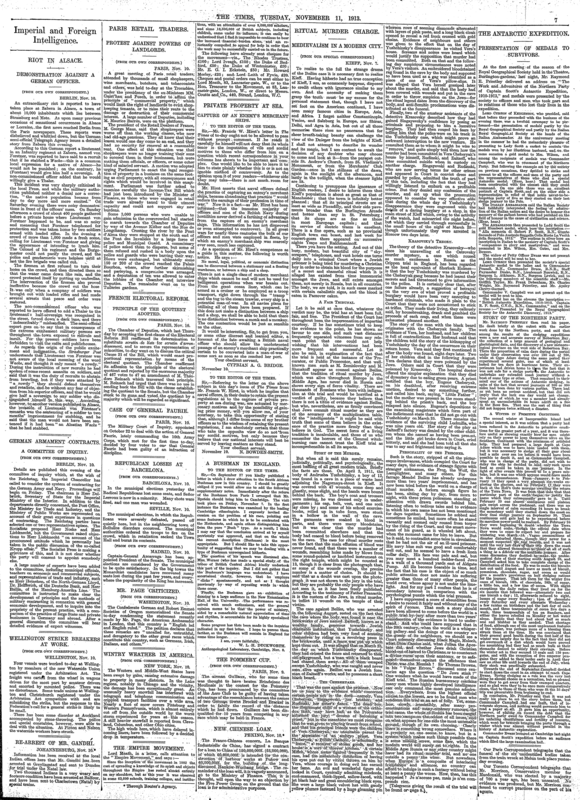 If one gives the primary documents (such as the German Declaration of War against France) and the actual facts of the case – the fact that the great French attack on Germany did not happen, then one can not play the complex game of “well it was partly their fault, and partly their fault and……”. It is the same in so many things – not just the First World War. Some historians hate Primary sources – because to go back to the Primary sources messes up what they want to say. By the way the Germans occupied Luxembourg on August 2nd 1914 – without bothering to write a declaration of war. They could have at least said that the mighty Legions of the Grand Duke of Luxembourg had attacked Berlin. Hmmm… I never realised the ills of modern society all stemmed from 19th century Prussian ambition. When I studied French at school, we had an Assistant from Alsace (a Francophone native helping out with French lessons), and our French teacher told us that he spoke French with a ‘German’ accent and he was often mistaken for a German in France. None of us pupils could tell that there was anything distinct when he spoke French, and then someone asked him if he could say something in English instead of French, hoping to hear his accent. He immediately said, in rough phonetics ‘Vot do you vant me to say?’, which satisfied our curiosity but also emphasised how ‘German’ he seemed. Not that that was any reason for him and his kinsfolk to be regarded as German or pertaining to the Reich. In the Rathaus (Town Hall) in Munich, the clock has a Glockenspiel with animated Knights that joust on the hour, and the colours are Blue and White for the victorious Bavarian Knight of Duke Wilhelm V, and Red and White for the Knight of Renate of Lorraine, celebrating their marriage. Why could they not all be friends? To paraphrase Boney M “Oh, those Prussians”. Just looked up the text of the German declaration of war. Lots of alleged air raids. You learn something every day. For a detailed and interesting account of the factors which lead to the First World War, try dreadnought by Robert K Massie. The German propaganda at home alleged ground attacks also – more lies. The thing is Patrick why did do not books on your shelves mention all this – and I do not doubt your word that they do not. It takes a couple of minutes to find out – so I do not believe that it is an innocent error on the part of the authors. Any more than I believe that those who write biographies of Barack Obama and leave out his lifelong Marxist associations are just making an innocent error. Sadly the people who write objective seeming books have an agenda – just as much as I do. The difference is that I am always (I hope) open about what my agenda is. Hey, you scholars! More people are interested in WW2, than in The Great War To End All Wars (WW1). The Imperial lies are not that interesting, whilst the reality that Germany was spoiling for a fight, is. Forster’s subsequent conduct moves him further from being an innocent victim. But am I the only one who read the early parts of this story with a sneaking sympathy for the repressive German Imperial Army? On a related note, Guy Sajer, who wrote the magnificent “The Forgotten Soldier”, mentions in his book that as an Alsatian German with mixed parents he was never fully accepted as either French or German. Honestly, the French were spoiling for a fight as much as the Germans were. To say that they were eager for a chance to reverse the result of 1871 and take Alsace-Lorraine back would be a great understatement. Interestingly, Copeland’s The Origins of Major War argues on the basis of his archival research that the true target of the war was Russia, and that the Germans had decided on war many years in advance. Tsarist Russia was simply growing too powerful, too quickly, and the Germans made the decision to expand the army with a draft *even though* it would strengthen the Socialists and inevitably lead to an expanded franchise, contrary to Patrick’s assertion in the original post that the Jünkers were trying to protect their privileges. Basically, the onset of the war was scheduled way back in 1911 to coincide with the 1914 completion of the Kiel Canal, which enabled quick transit of naval forces from one coast of Germany to the other. It was then that Germany’s power relative to Russia’s would be at a local maximum, soon to be lost. France was in the crosshairs primarily because it had allied with Russia. To invade Russia without settling France’s hash would have been suicidal. Quite so Michael – and at some future date the French (and the Russians) might well have attacked. But they did NOT attack when the Germans said they did. The Emperor of Russia had no intention of attacking Germany in 1914 – so the August 1st Declaration of War by Germany was not justified. And the French had NOT attacked Germany – so the Declaration of War by Germany on August 3rd was not justified. True (totally true) that at some future date the French and Russians might have attacked – say in 1918. And look how Germany had alienated both France and Russia. In 1870 even Bismark opposed the annexation of A-L – yet Prussia-Germany did it anyway. And Imperial Russia had once been the ALLY of Imperial Germany – after 1890 Germany said it did not WANT Russia as an ally (it basically told them to go f…. themselves, and for no reason). As with the hostility with Britain (once a close FRIEND of Prussia-Germany) Imperial Germany (or rather the political and academic leadership – more closely linked in Germany than in any other nation) to MAKE enemies. “Whom the Gods wish to destroy they first drive insane”. And the policy of Imperial Germany was insane. They went out of their way to make enemies – to make other nations oppose them. It is like a man who comes into a bar. One person in the bar already does not like him very much (France) – the man goes up to the person who does not like him very much, and spits in his beer and kicks him in the testicles. Oddly the other man (France) no longer just does not like Mr Germany – he now utterly detests him. Two other men (Britain and Russia) are also in the bar – they have nothing much against this “Germany” bloke. For some reason Mr Germany is annoyed by these other people not hating him – so he goes and spits in their beer as well. “Hey you Slav subhuman” (to Russia) and “I am going to build a great navy and take over the world” (to Britain). Then he sits in the corner saying to himself………..
“These other people in the bar do not like me, I think they are plotting against me – I had better strike first. I know, I will start shooting at them and say they started shooting at me (even though they have not). After all I am sure to plan to shoot me one day…..”. It is insane – totally insane. None of these people would be out to shoot him (if they are at all) – if he (Mr Germany) had not spent DECADES turning friends into enemies. How do you explain this, Paul? I mean, it is not difficult to explain in a single person (your bar scenario is very realistic – we all know about people like that). But how does one explain this in a group of people? The power of ideas Alisa – the power of ideas. The mixture of ideas in Germany was toxic. It was toxic in most countries. But it was especially toxic in Germany. Even in the early 1800s (a century before the First World War) statism and racialism were popular among some thinkers in Germany (more so than in other lands). Herder’s weird views of different nations being as different as different species of animal. Then (later) Bismark’s return to the power politics of Frederick the Great. It all gets madder and madder – for example Bismark was overwhelmed by the very forces he had supported. They get rid of him (as too moderate) in 1890 – and by that time Bismark (relatively speaking) actually is a moderate. The best introduction into German thought is the works of Mises and Hayek – they were there (in the German speaking world) at the time. They knew key people. They also watched Germanic ideas influence other countries. For the enemies of Germany were influenced by its ideas. Just as the enemies of Islam were influenced by Islamic ideas. Where do you think Christians got the idea of making Jews wear special costumes from? Pope Innocent III and the rest never admitted it – but this idea came from Islam. Mastiff – yes one of the MANY mistakes of Sir Max Hastings (the establishment’s most favoured historian) is his pretence that Germany was dominating Europe economically – “developing so much faster” (and all the rest of the drivel this man comes out with). France (per head of population) was actually doing better – especially in new industries. And Russian economic growth was much higher than German(although from a lower base). In time Russia would have dwarfed Germany. And Germany had gone out of its way to make Russia an enemy. After all according to fashionable German philosophy all powers were NATURALLY enemies – in the struggle for existence. So destroy-or-be-destroyed is the de fault position of such thinking. We must destroy Russia – because when they are powerful they will destroy us. Because that is what we would do if we were them. Wow Paul, that is fascinating. And, sadly, it all makes sense. But I was given to understand that they were weak on history – or were they? I think the German warship building push also freaked out the Brits. Thoughts? Was not Colonialism also a great cause of friction between the great powers Paul? Germany jealous of the British and French empires wanted its place in the sun too, and started muscling into Africa. Alisa, the chapter on Germany in Barbara Tuchman’s The Proud Tower addresses much of your question. It can be read without having to read the rest of the book – although I’ve enjoyed it all as well. Alisa Hayek and Mises are strong on intellectual history – history of ideas. Especially of the German lands. Weaker on other areas of history. Of course for a man born in 1881 (Mises) what we are talking about her was not really history – it was current events. RAB – yes Germany wanted its “place in the sun”. Especially as the places it did take over were money wasting, useless places. The Germans looked hard for things of use in South West Africa – but could not find anything. So they passed the time by hunting an killing the locals. They were not big on team games you see – no cricket or rugby for them, so it was a question of finding something to do. Yes the German High Seas Fleet had no defensive purpose – as Germany had no colonies worth defending. I seem to remember that in both Socialism and Road to Serfdom there is a chapter near the end where the authors (Mises and Hayek respectively) lose all sense of objectivity and condemn the German Historical School. The naval arms race is another example where German policy is worse than a crime, it’s a mistake. First they build, annoying the Brits. Then they realise a land war is coming with France and Russia. At this point they completely switch gears, scaling back the naval programme and expanding the army. At this point the smart thing to do would have been to have come to some sort of agreement on naval arms (Churchill offered them one) but no. This left Britain confused and hostile with disastrous consequences in 1914. A good starting point is to read von Mises’ Omnipotent Government, (1944) courtesy of the Mises Institute. Here is a helpful excerpt, page 7. The present crisis of human civilization has its focal point in Germany. For more than half a century the Reich has been the disturber of the peace. The main concern of European diplomacy, in the thirty years preceding the first World War, was to keep Germany in check by various schemes and tricks. But for German bellicosity, neither the Czars’ craving for power nor the antagonisms and rivalries of the various nationalities of southeastern Europe would have seriously disturbed the world’s peace. When the devices of appeasement broke down in 1914, the forces of hell burst forth. On reading that book, it occurred to me that the abridged version of the book might have been, as if no one had thought so at that time for themselves: ‘Germans are bastards, they have been bastards for all living memory, and unless they change their ideas, they always will be. (Ludwig Erhardtet al excepted)‘. And let us not forget one of the grosser German crimes from early WW1, before they might have been war-worn, the Sack of Louvain (Leuven), some 27.5 years before Bomber Harris set to work. And here’s another excerpt from OG, 1944. It is true that outside of Russia and Germany dissenters do not yet risk the firing squad or slow death in a concentration camp. But few are any longer ready to pay serious attention to dissenting views. If a man tries to question the doctrines of etatism or nationalism, hardly anyone ventures to weigh his arguments. The heretic is ridiculed, called names, ignored. It has come to be regarded as insolent or outrageous to criticize the views of powerful pressure groups or political parties, or to doubt the beneficial effects of state omnipotence. Public opinion has espoused a set of dogmas which there is less and less freedom to attack. In the name of progress and freedom both progress and freedom are being outlawed. The defining motive of many countries during the Victorian Age was Britain-envy. Britain was the trading center of the world, and other countries wanted to emulate her, and then surpass her. We shouldn’t blame other countries for competing, though the bellicosity of the German’s approach should be condemned. Colonialism was actually NOT a source of conflict. Ironically, the Treaty of Berlin prevented much of that by setting out clear principles whereby the various European powers could impose themselves on Africa without getting in each other’s way. One of the bad consequences of this is the shape of many modern African countries that cut right across ethnic boundaries and encourage permanent conflict in post-colonial Africa. Benin, Togo, The Gambia, to name but three. Examples: the First World War didn’t break out over Agadir, or Fashoda, or any other incident in Africa. Not even the Boer War, which might have been excellent for anti-British propaganda. The defining motive of many countries during the Victorian Age was Britain-envy. Britain was the trading center of the world, and other countries wanted to emulate her, and then surpass her. I don’t think envy is true, expect in the case of German intellectuals. They hated Paris for being a cultural centre in a way that Berlin never would be. They hated London for being a centre of power. We’re talking about a worldview that thought burning the library at Louvain would make people respect Germany. At least the Nazis didn’t boast about their death camps. The Kaiser would have. The french didn’t like the fact that Britain was powerful, nor that English (because of British power) was becoming the lingua franca of the world- as it has since become. If you are a powerful country, other countries will envy you, and the Victorian age was the height of British power. The German naval buildup was probably the stupidest idea of the many stupid ideas of Wilhelm 2. Building a navy large enough to antagonise Britain but not large enough to defeat it. As someone or other said “Nothing more expensive than a second best fleet”. Wasn’t Alsace German until it was depopulated during the 30 years war. And didn’t Louis XIV then populate it with Frenchmen in order to expand the territory of France? Ah, the historical ethnic mess that is Europe. Great Britain too. Somehow I think this all worked better in the time of kings and barons, at least the loyalties began with loyalty to the local ruler. Who the local ruler owed allegiance to was probably of little concern to the peasants. And then came religious war, followed by ethnic war, followed by ideological war. So it goes. We’re talking about a worldview that thought burning the library at Louvain would make people respect Germany. As the centenary of the start of WWI approaches I am determined to remember and remind people about this and similar atrocities. I have been interested for years about why it is that so many people are determined to believe that the mass shootings of hostages in Belgium in the opening days of World War I were entirely an invention of the propagandists in the Daily Mail. You have just reminded me to buy a book called German Atrocities 1914: A History of Denial. Patrick’s bulletins from 1913, including this one, have sometimes touched on this topic, and I hope he will continue that. I am not nearly as knowledgeable about military history as some people here, so this is tentative, but my impression is that the WWI Germans got less prone to atrocity as the war went on. Why? I think in 1914 the mental models of war they had to go on were either the Franco-Prussian war or their colonial wars. The Franco-Prussian war started off with stunning victory at Sedan, and even the harder campaign against the Third Republic under Adolphe Thiers (mentioned in another context in my post from Sunday) ended in them basically stomping on the French. The heartbreakingly one sided nature of the German colonial wars against the Herero, for instance, is a matter of record. My guess is that the Germans in Belgium started off with those examples in mind. Hence the Schrecklichkeit. But as war progressed, dreadful as it was, with as many killed in single days as in the massacres, at least it was a war between approximate equals. (1) There’s been plenty of conflict within countries, so short of giving every single ethnic group (or sub-group?) their own nation…. (2) There’s been a near-complete lack of conflict along some borders that do span ethnic groups, e.g. Southwestern Sudan and Zaire/Congo, so this is not necessarily a sufficient cause either. Squawkbox: possibly. But OTOH it depends on who the larger enemy may be. Chuck – Louis XIV (the “Sun King”) was indeed a monster (a refutation of H.H. Hoppe’s view that an hereditary rulers will look to the long term advantage of the Realm), but he did not replace the population of Alsace. As you point out there was no national government of “Germany” at the time – as Voltaire was later to say of the Holy Roman Empire “it is not holy, Roman, or an empire”. Political loyalty was to various Kings, Princes and Grand Dukes – Louis XIV just made himself the ruler of Alsace. Indeed Alsace even retained some political autonomy – right up to 1789. Indeed I think inheritance law is slightly different in Alsace to this day – although Antoine will know more about that than I do. France may declare (endlessly) that it is one and indivisible – but that is not quite how things work in practice. For example even in Brittany (in union with France since the 1400s) tax law was quite different till 1789 – indeed some things are different even now (for example the French government still does not, I am told, collect tolls on Breton roads – as only the Estates [Parliament] of Brittany historically had the power to do that. There may indeed be (yet another) Breton tax revolt against a collectivist regime in Pairs in the works as I type this. Hayek and Mises do not lose all objectivity when they attack the German Historical School. The German Historical School (like the American Pragmatists) deny objective truth. They thought that universal reason (for example universal economic law) was “French” and therefore bad – this sort of thinking goes back all the way to Herder and Fichte in the very early 1800s. And they took the “historical stage” thinking of Hegel to its “logical” (i.e. radically demented) extreme – something only being true at a particular “stage” and for a particular “people” (folk – volk), right and wrong (both true and false – and good and evil) being all relative to this. It is impossible to be objective about the German Historical School without pointing out that they were radically ANTI objective. “Paul this is just a long winded way of saying they were evil”. All that being said – it should also be pointed out that French cultural, intellectual and political culture went off the rails. The search for universal truths (not limited to a race or geographical area) was (and is) a noble aim, but French intellectuals (and politicians) looked (and still look) for these truths in the wrong places – for example in socialism. The Bavarians (Southern German) are well known for their cultural and political conservatism – the sterotype of the “why do you do that?” “because we always have”, “why do you not do this?” “because we do not” situation. This is not satisfying from an intellectual point of view – but it is better than grasping for universal truth, and grabbing hold of universal FALLACY. Better a Bavarian farmer or townsman than a Left Bank intellectual in Paris. But then French farmers and small town people could say the same. And better a Paris intellectual (for all their folly) than a traditional German intellectual. The French intellectual may fail utterly in his or her seeking for truth (for good)- but the German intellectual is not even trying to find such things. The German intellectual (at least the dominant type of the last couple of centuries) believes it is all relative anyway – just justifications for POWER. The relativism of German thought is mixed with a strange dogmatism. The last bit (the “we will grind you into the dirt” bit) is gone – thankfully. For example – the Germans scoff at any opposition to the European Union based on economic law or political principle. This is “absurd universalism – which denies the force of history”. However, the European Union is not questioned – “European Unity” is the unquestioned objective, opposition to it is treated as a form of mental illness. For it denies “history” and “social forces”. Of course not all Germans are like this. However, it is true that ALL the parties in the German Parliament are committed to the same gaol (European Unity). Indeed the Chancellor of Germany is very proud that there is no dissent in the German Parliament. Which seems an odd thing for a person to be proud of. Last point – this is NOT a matter of the German language. After all it is easy to find dissent in Austria (including in the Austrian Parliament) – and Austrians speak German. Perhaps the Bavarian CSU will day decide that it is more Austrian (in this respect – in relation to dissent) than German – but it has not happened yet. What went wrong with Germany? A perfect storm of victory disease. First, the Prussian military tradition (which really only dates back to Frederick the Great’s father). Then Frederick’s successes, which raised the prestige of the military class. Defeat by Napoleon then revival by intensification of the military ethos. Another period of relaxation, suddenly reversed by the spectacular victories over Austria and France. This happens just as Darwinian ideas are spreading. So a lot of German intellectuals mash together Darwinism and recent victories, and invent the idea of the German master-race. Next, twenty years reign by Wilhelm I, who fetished military prestige and pomp. The sidelining of brief reign of Friedrich. The indoctrination of Wilhelm II by his grandfather, and his early succession. There’s a lot of tinder piled up. But even after all that, it still doesn’t actually have to blaze up. And much of it might not have to be there, except for historical accidents. As to why German atrocities in WW I went down the memory hole… After the war, after the gigantic losses of the war, there was enormous revulsion against the very idea of going to war, especially among intellectuals. After millions of dead in the trenches, the killing of a few thousand Belgian civilians seemed trivial. Also, there was embarrassment about “Beastly Hun” propaganda during the war, much of which was false. Anything which seemed to justify war was unacceptable and tainted. It was all a plot by the Merchants of Death. Progressives, liberals, and radicals all hated the general idea of war much more than any particular aggressor. War guilt was considered general. Therefore, particular crimes were irrelevant, and to be forgotten. Progressives almost always liked the idea of the aggressive socialists launching war and prevailing, particularly if victories weakened or destroyed those who stood in their way. But they could not say so openly, so they adopted ‘peace’ as a tactic. One of my fantasy alternative histories. The Empress Elizabeth of Russia lives – and rides into Berlin (at the head of her Cossacks), Frederick “the Great” being dragged behind her horse. As both General Foch of France and General “Black Jack” Pershing argued in 1918. “The Germans will only truly understand they are beaten if we ride into Berlin”. @ Paul, I suspect that the mass rapes by the Red Army in eastern Germany brought the message home in a readily comprehensible manner. Perhaps like this Sudeten German woman, who has certainly had an ordeal, as the colour film from Spring 1945 shows. Mr Ed – the horror of World War II (including the horrors at the end of it) were caused by the failure to fight World War One to a finish. Sometimes a thing (even a very bad thing) has to be finished. Because the consequences of not finishing it are even worse than completing it. Foch and the others were correct – German “unity” was a mistake, the independent historic states of the German lands (such as Bavaria) should have been restored. Yes the reasoning of the French was selfish (self interested) but it was correct. And Woodrow Wilson (and J.M. Keynes) were wrong. Does that even need to be said? Does it need to be said? I would venture a ‘yes’, for the benefit of the casual visitor. Listening from time to time to BBC Radio 4 discussions on economics here in the UK, one hears of Keynes without any criticism. The truth is like a little dung beetle, and every scoundrel tries to hide it under a cowpat of lies and a dung heap of fallacies. That eternal little beetle deserves, nay requires, our help in turning over the steaming piles of obfuscation that drop out of socialists’ mouths instead of their bottoms. I’m not sure I like being likened to a dung beetle. Methinks you’ve pushed that analogy just a wee bit too far! Well, they are just as crazy as their fathers and grandfathers, or at least a little bit. That the Germans, as a nation, were just stark mad, utterly crazy and lunatic – this cannot be doubted after WW2. The signs were already apparent in the 19C and in WW1 and fully visible in WW2. German philosophers, like Hegel, Heideger, and even Karl Marx are totally irrational or anti-rational. Luckily, their madness takes, nowadays, the form of an obsession with useless windmills and solar panels. Their “Energiewende” is just typical of a grand, romantic, and impossible, absurd adventure they are fond of. (a little bit like the Third Reich…). Fortunately, this project is not as sinister as the former ones, though not less absurd. It is probably a little over the top to make such a strange comparison, but, I think, madness is madness. Nicht normal. Jacob, I find it not a little disturbing that there iswithin German Leftism an Anti-German Movement, with one song ‘Bomber Harris Do It Again’, with the refrain ‘Deutschland muß sterben’ (Germany Must Die). If one could explain to these collectivists the irony that the mentality they show is of the same nature as that they affect to despise, and Sir Arthur Harris would have had no wish to do other than to eliminate the State that threatened his own and other nations when it was necessary to do so, would they change their minds, or simply attack? The irony being that decades of German irrationality has culminated in the flowering of an anti-German movement which could only have arisen out of the bizarre and vicious history of collectivist German political thought, not opposed to the principles of collectivism, but opposed to yet being a manifestation of it. Laird, I was referring to the truth, despised by many, yet vital to us all, as the beetle, not you. I would be proud to help a virtuous dung beetle of truth, however humble, over any beast made of lies. ” ‘Deutschland muß sterben’ ” ?? Jacob, indeed, it could have made for a better world. And it could all have been achieved by letting the Federation split into 1,000 Liechtensteins, perhaps lacking comparable art collections – despite thieving British Customs rules chipping away at his Highness’ collection. Mr Ed and Jacob – agreed. Mr Jones – not a perfect account, but there is a lot of truth in it.